This is the eleventh book in The Oz Series by L. Frank Baum. When Princess Ozma mysteriously disappears, four search parties are sent out, one for each of Oz's four countries. Most of the book covers Dorothy and the Wizard's efforts to find her. Meanwhile, Cayke the Cookie Chef discovers that her magic dishpan (on which she bakes her famous cookies) has been stolen. Along with the Frogman, they leave their mountain in Winkie Country to find the pan. There could be no doubt of the fact: Princess Ozma, the lovely girl ruler of the Fairyland of Oz, was lost. She had completely disappeared. Not one of her subjects—not even her closest friends—knew what had become of her. It was Dorothy who first discovered it. Dorothy was a little Kansas girl who had come to the Land of Oz to live and had been given a delightful suite of rooms in Ozma's royal palace just because Ozma loved Dorothy and wanted her to live as near her as possible so the two girls might be much together. Dorothy was not the only girl from the outside world who had been welcomed to Oz and lived in the royal palace. There was another named Betsy Bobbin, whose adventures had led her to seek refuge with Ozma, and still another named Trot, who had been invited, together with her faithful companion Cap'n Bill, to make her home in this wonderful fairyland. The three girls all had rooms in the palace and were great chums; but Dorothy was the dearest friend of their gracious Ruler and only she at any hour dared to seek Ozma in her royal apartments. For Dorothy had lived in Oz much longer than the other girls and had been made a Princess of the realm. Betsy was a year older than Dorothy and Trot was a year younger, yet the three were near enough of an age to become great playmates and to have nice times together. It was while the three were talking together one morning in Dorothy's room that Betsy proposed they make a journey into the Munchkin Country, which was one of the four great countries of the Land of Oz ruled by Ozma. "I've never been there yet," said Betsy Bobbin, "but the Scarecrow once told me it is the prettiest country in all Oz." "I'd like to go, too," added Trot. "All right," said Dorothy. "I'll go and ask Ozma. Perhaps she will let us take the Sawhorse and the Red Wagon, which would be much nicer for us than having to walk all the way. This Land of Oz is a pretty big place when you get to all the edges of it." So she jumped up and went along the halls of the splendid palace until she came to the royal suite, which filled all the front of the second floor. In a little waiting room sat Ozma's maid, Jellia Jamb, who was busily sewing. "Is Ozma up yet?" inquired Dorothy. "I don't know, my dear," replied Jellia. "I haven't heard a word from her this morning. She hasn't even called for her bath or her breakfast, and it is far past her usual time for them." "That's strange!" exclaimed the little girl. "Yes," agreed the maid, "but of course no harm could have happened to her. 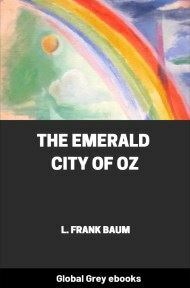 No one can die or be killed in the Land of Oz, and Ozma is herself a powerful fairy, and she has no enemies so far as we know. Therefore I am not at all worried about her, though I must admit her silence is unusual." "Perhaps," said Dorothy thoughtfully, "she has overslept. Or she may be reading or working out some new sort of magic to do good to her people." "Any of these things may be true," replied Jellia Jamb, "so I haven't dared disturb our royal mistress. You, however, are a privileged character, Princess, and I am sure that Ozma wouldn't mind at all if you went in to see her." "Of course not," said Dorothy, and opening the door of the outer chamber, she went in. All was still here. 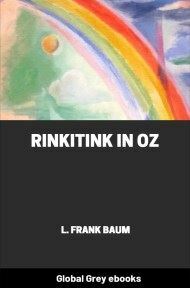 She walked into another room, which was Ozma's boudoir, and then, pushing back a heavy drapery richly broidered with threads of pure gold, the girl entered the sleeping-room of the fairy Ruler of Oz. The bed of ivory and gold was vacant; the room was vacant; not a trace of Ozma was to be found. "She isn't in her rooms now, so she must have gone out." "I don't understand how she could do that without my seeing her," replied Jellia, "unless she made herself invisible." "She isn't there, anyhow," declared Dorothy. "Then let us go find her," suggested the maid, who appeared to be a little uneasy. So they went into the corridors, and there Dorothy almost stumbled over a queer girl who was dancing lightly along the passage. "Stop a minute, Scraps!" she called, "Have you seen Ozma this morning?" "Not I!" replied the queer girl, dancing nearer. "I lost both my eyes in a tussle with the Woozy last night, for the creature scraped 'em both off my face with his square paws. So I put the eyes in my pocket, and this morning Button-Bright led me to Aunt Em, who sewed 'em on again. So I've seen nothing at all today, except during the last five minutes. So of course I haven't seen Ozma." "Very well, Scraps," said Dorothy, looking curiously at the eyes, which were merely two round, black buttons sewed upon the girl's face.